The Indonesian National Transportation Safety Committee (NTSC) issued their preliminary report regarding the runway excursion accident involving a Boeing 737. Seven safety recommendations were issued addressing various aspects of airport safety. 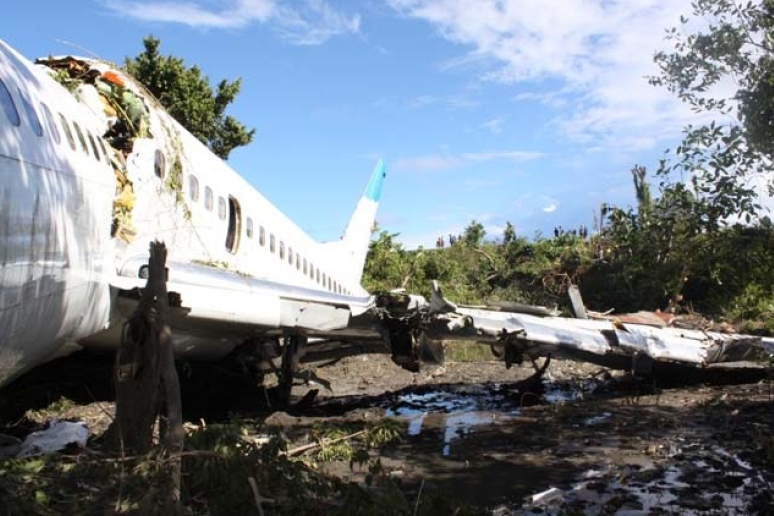 On April 13, 2010 a Boeing 737-322 passenger plane, registered PK-MDE, sustained substantial damage in a runway excursion accident at Manokwari-Rendani Airport (MKW/WASR), Indonesia. All 103 passengers and seven crew members survived but ten sustained serious injuries. Merpati Flight MNA836 operated on a scheduled flight from Sorong-Dominique Edward Osok Airport (SOQ/WAXX). Departure was delayed for almost three hours due to heavy rain over Manokwari. On approach Rendani Radio informed the crew that the weather was continuous slight rain, visibility 3 kilometers, cloud overcast with cumulus-stratocumulus at 1,400 feet, temperature 24 degrees Celsius, QNH 1012 hectopascals. At 10:54 the crew reported that they were on final for runway 35. The controller informed them that the wind was calm, runway condition was wet and clear. The crew read back the wind condition and that the runway was clear, but did not mention the wet runway condition. The aircraft was observed to make a normal touchdown on the runway, about 120 meters from the approach end of runway 35. Witnesses on the ground and on board reported that engine reverser sound was not heard during landing roll. During the landing roll, the aircraft veered to the left about 140 meters from the end of runway 35, then overran the departure end of runway 35. It came to a stop 205 meters beyond the end of the runway in a narrow river; the Rendani River. The airport rescue and fire fighting unit was immediately deployed to assist the post-crash evacuation. Due to the steep terrain 155 meters from the end of runway 35, the rescuers had to turn back and use the airport’s main road to reach the aircraft. The accident site was in an area of shallow muddy water surrounded by mangrove vegetation. 1) The Directorate General Civil of Aviation (DGCA) should ensure that Merpati Nusantara Airlines Operational Specifications and other technical and operational safety requirements are met. 2) DGCA should urgently review the Rendani Airport, Manokwari runway complex, to ensure that the runway end safety areas (RESA) meet the dimension Standards prescribed in ICAO Annex 14. 3) DGCA should urgently review all airports involving Part 121 and 135 operations, to ensure that the runway end safety areas (RESA) meet the dimension Standards prescribed in ICAO Annex 14. 4) DGCA should urgently ensure that Indonesian airports equipped with visual approach slope guidance systems, maintain the equipment to a serviceable standard. 5) DGCA should review the procedures and equipment used by airport Rescue and Fire Fighting Services to ensure that they a) meet the minimum requirements, including timeliness, specified in ICAO Annex 14; and b) meet the requirements to cover the area up to 5 NM (8 Km) from the airport perimeter. 6) Merpati should review its technical and operational safety requirements to ensure they are implemented. 7) Merpati should review equipment used by airport Rescue and Fire Fighting Services at airports in its network, to ensure that they meet the minimum requirements for Boeing 737 aircraft.